Fox jacket size 12-14 with hook and eye closure - hand made in UK. Only worn twice, no signs of wear. although the Hobbs label as pictured has ripped the lining a little. Lovely length - quite long, so it will go over the top of anything. 3 button fastening and side pockets. Soft brown Faux fur jacket. Waist: 34". Sleeve underarm to cuff: 19". Shoulder to shoulder: 17". 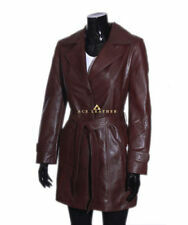 Ladies Eastex brown knee length Wool/ Cashmere Coat Size 16, fully lined. Never worn. Excellent condition. From a smoke free environment. Gorgeous Musto Ladies Brown Fleece Size 10. Condition is Used. Measures 20” approximately armpit to armpit and 26” top of shoulder to the hem. The pockets are not zipped. H&M BROWN FULLY LINED HERRINGBONE BROWN HACKING STYLE JACKET WITH POCKETS AND MOCK LEATHER BUTTONS. SIZE 16 (42 EUR). Per Una Ladies Gillet Size XL /16. Condition is Used. Ladies brown reversible body warmer. Good used condition. Machine washable and from a smoke free home. 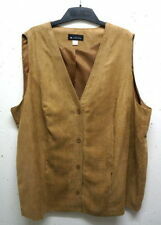 Horka Gilet Size Large . Condition is Used. Dispatched with 2nd class post. Very versatile jacket, it has removable hood(zip) and removable sleeves(zip)turning into a gilet. Lovely soft fur inside of the jacket. Joe Brown Jacket Size 22. Dispatched with eBay delivery – Shutl 1 day. New listingLakeland Soft Brown Leather Jacket size 16 fully lined. Long Tan Faux Suede Trench Coat Size 14 (more size 12). Condition is Used. Regatta Womens/Ladies Lightweight Fleece Bodywarmer Gilet. Dispatched with Royal Mail 2nd Class. Golddigga Brown Leather Jacket Size 16. Never worn. Genuine Real Leather Jacket Suede brown jacket. Complete with cowboy style tassels. Popper fastening on the front. Main colour brown with orange lining. Made by: Genuine Real Leather Company Size: M (I would say best fit UK size 12) Used - Due to age there is a bit of colour fading, I noticed this particularly around the wrist area. I did take a picture so you can see clearly for yourself. Any questions please message me. Victorian Regency Gothic Style Velvet long line Coat Plaid filigree ascents.